Can the sudden onset of diarrhea in the morning—especially ONLY in the morning—mean a certain kind of cancer? Colon cancer, as well as ovarian cancer, are definitely known to cause diarrhea. What’s especially concerning to a person, however, is if most or all of their diarrhea occurs in the morning – either upon getting out of bed (feeling the urge and then it immediately comes), or being awakened very early in the morning by a sudden urge – and then lo and behold – diarrhea in the toilet bowl. Diarrhea from cancer can occur in the morning, but can it ever occur BECAUSE it’s morning? 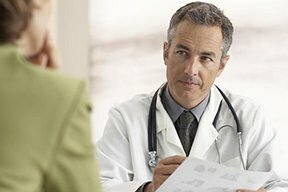 “Diarrhea can occur at any time of the day — and for any reason (cancer, GI infection, IBS, colitis), but it’s not just in the morning,” says Susan L. Besser, MD, with Mercy Medical Center, Baltimore, and Diplomate American Board of Obesity Medicine and board certified by the American Board of Family Medicine. “I really can’t think of any illness that causes diarrhea ONLY in the morning,” adds Dr. Besser. If you’ve been having diarrhea only or usually in the morning lately, there is no need to panic over a cancerous cause. There is nothing intrinsic or unique about morning that would make colon cancer or any medical condition produce diarrhea only at this time. “Diarrhea is a rare symptom of colon cancer,” says Pankaj Vashi, MD, Lead National Medical Director, National Director, Gastroenterology/Nutrition/Metabolic Support, Cancer Centers Treatment of America, in this article. Diarrhea is also uncommon with ovarian cancer, and again, there is nothing specific about dawn or 8 AM that would give rise to diarrhea from this disease. Nocturnal diarrhea – that which comes overnight and in the wee morning hours – can be caused by food poisoning or microscopic colitis (a benign inflammatory bowel disease). However, these conditions can also cause their notorious symptoms any time of the day or evening. Colon Cancer Diarrhea vs. IBS Diarrhea: Is There a Difference? Can Diarrhea Be the Only Symptom of Colon Cancer? Can Diarrhea in a Cat Be Caused by Cancer?